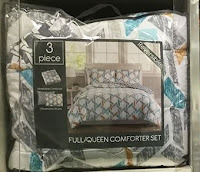 Now thru 7/3, head over to Macy’s and score these 3-Piece Reversible Comforter Sets for just $19.99 – regularly $80! Perfect time to update your bedroom look. Choose from a variety of styles and colors! Shipping is FREE on orders of $99 and more or when you add ANY beauty item to the purchase (starting at $2). See all the deals here!